At first listen, Harry Partch’s composition are a cacophony of atonal noise. But if you listen long enough something wonderful happens…..you enter a new musical landscape. 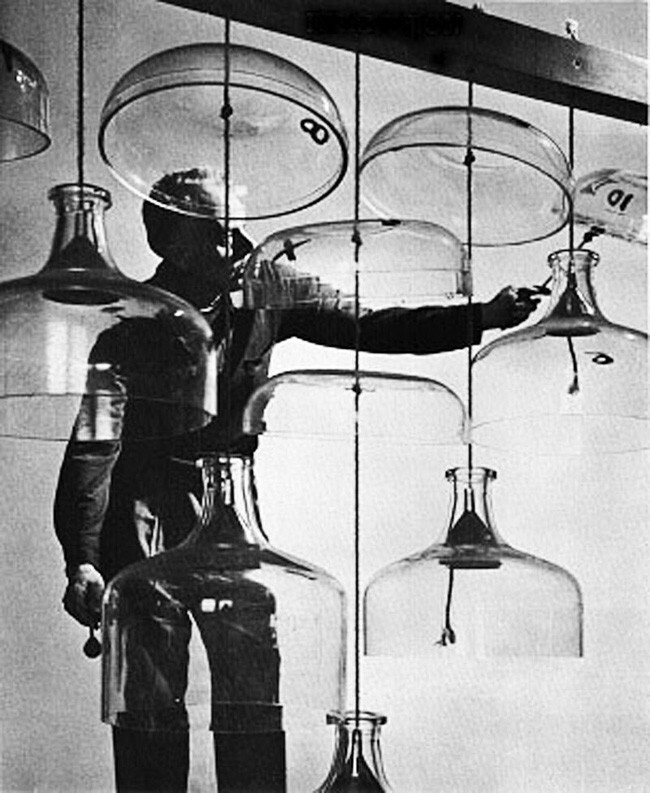 Harry Partch is not the most famous of composers. His music is obscure, difficult to listen to and can’t even be played on normal musical instruments. Despite this, Harry Partch is probably one of the most important figures in 20th century music. Without Partch, music would be at best duller and less imaginative and at worst like a rainy day in Hell with Andrew Lloyd Webber. In a life that spanned most of the 20th century Partch rebelled against the hypocrisy and conformism he saw all around him and in doing so created a new musical universe. Albeit one that requires a complete reconfiguring of your brain to appreciate – that’s because at first listen, his music sounds bloody awful. 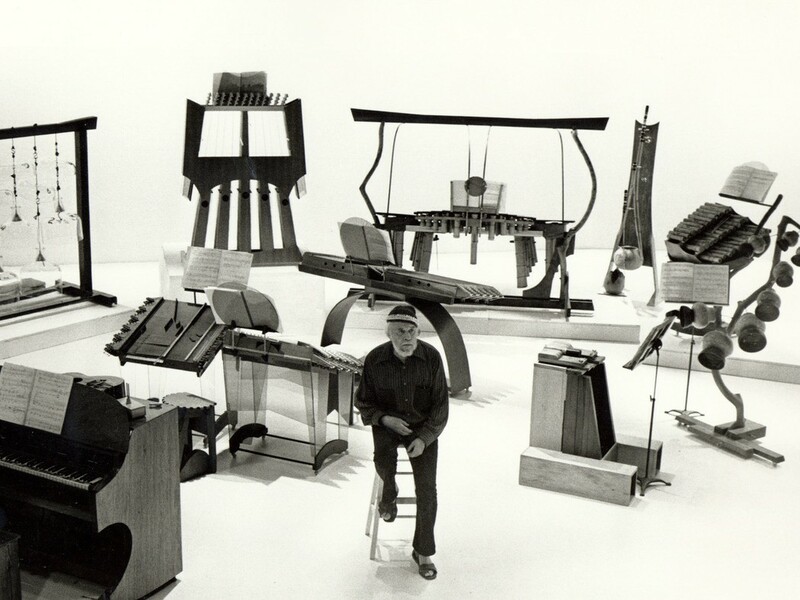 Harry Partch began his career in a conventional manner, studying music at the university of southern California in the early 1920s, but he quickly became disillusioned with the whole ethos of the concert music he was being taught. To Partch this was a middleclass, 19th century European tradition as hidebound and immobile as a stuffed rhino. This tradition represented the status quo, safety and conformism and only served to spark off Partch’s already highly flammable radical spirit. Within six months he had dropped out of University and began to consider how he might create a new and unique form of composition. Partch had a vague concept that music should be tied to the natural speaking voice but his ideas seemed at odds with everything he heard in the musical environment of contemporary Los Angeles. Then one day in the mid 1920s he finally found the answer. It was the key to everything that Partch would later do, and it came in the form of a book called “On the Sensations of Tone” by Herman Helmholtz. After reading Helmholtz’s book, first published in the 1880s, Partch felt confirmed in his belief that far from being natural, there was in fact no logical reason for the 12-tone octave that had been the entire basis of Western music for the past five hundred years. Partch saw the whole thing as a musical conspiracy. But now that Partch had developed a microtonal scale he had to figure out a way to write it down in notation form. And this was just the first of the challenges he faced working in microtones. The first instrument he built in order to play his microtonal scale was the Adapted Viola. So named because that’s what it was – a viola, with the neck of a cello, tuned to Partch’s specifications and played between the legs instead of under the chin. It was the crystallisation of his musical philosophy. And in the late 1920s he began to receive recognition. Partch came to the attention of supporters and patrons intrigued by his new ideas. But, never one for a comfortable life, Partch instead alienated many of them with his actual music. The first work he recorded in the new idiom was musical settings of verses by the eighth century Chinese poet, Li Po. This was a deliberate choice. Partch’s parents had been missionaries in China shortly before his birth and now Partch was celebrating the very heathen they wanted to convert. Partch had no time for Christianity and all his life rebelled against it and the control it represented. Instead he was drawn to more primitive cultures and religions. Born in 1901 in California and raised in a desert town Partch had realised from an early age that he was gay – not the best forward in life in early 20th century America. His own feeling of existing outside of the acceptable norms of society led him to identify with others viewed in the same way. Like the Yaqi Indians who lived in a small enclave in the desert close to his childhood home. Partch felt both contained and constrained by the modern world. He saw primitive cultures as having more freedom and all his life would use ancient beliefs as a source of inspiration for his music and his life. In 1934 with the assistance of his patrons he spent a year in London studying ancient concepts of tonality and commissioning his first adapted reed organ – the sonorously-named Chromelodeon. But he wasn’t content with just building these strange instruments – he had to continue to push musical boundaries. His career was going from strength to strength and he returned from his European trip in 1935 with high expectations for the future. Unfortunately he arrived home in the middle of the Great Depression. Musically, the Depression was a boomtime for Busby Berkely and Fred Astaire, but not the best period for an Avant Garde composer with a musical philosophy that only 10 or 20 people understood. Partch made a decision that no other major composer has probably ever considered. Some artists take the phrase “on the road” to mean hiring a nice car or hitching with friends. 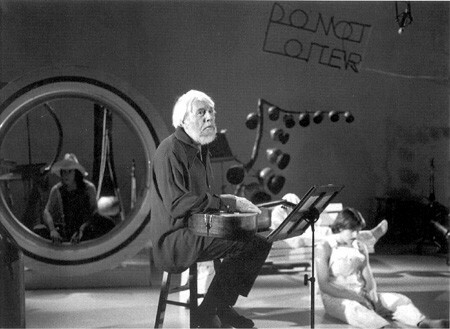 Harry Partch became a hobo. For the next ten years or so he joined the great mass of unemployed people railroading across the mid west. As he travelled around the country, Partch experienced hardship and also great freedom. As a bum, Partch may have been homeless, broke, filthy and starving, but for the first time he didn’t have to hide his sexuality. This was his chance to become a modern day primitive man. During this time Partch composed no music but it greatly influenced his later work, considered by many as his best. It was a time of sacrifice but one worth making for the freedom it gave him sexually, socially, and even musically as he continued to conceive artistic ideas. He kept a journal called Bitter Music in which he drew pictures of life on the road, kept a diary and wrote down the inflections of individual hobo’s speech patterns. This would play an enormous part in the music he later composed about his decade on the road. Partch’s life changed again in 1943. He had never given up on his music and his concepts suddenly came to the attention of the Guggenheim foundation in New York, which gave him a fellowship. Partch could now leave the road for good. By this time he had managed to build a whole new set of instruments that were bigger and ever more elaborate. Partch was always interested in the way his instruments looked. He was as concerned as much with their visual beauty as with the sounds they made. Partch adopted irony in his instrument building. The cloud chamber bowls took something destructive, Pyrex carboys used in nuclear experiments, and put them to creative use. Now with the new instruments the style of the music was beginning to change from vocal to instrumental works. And the way in which the musicians were compelled to move by the instruments they were playing lead to a new form of performance. For the few people who saw this multi-media experience during the 1950s, it was unlike anything else before or since. But the expense, time and commitment involved in staging a performance meant that very few were actually given. But as he approached the mid 1960s he be was as secure, professionally, as he had ever been. The growing counter culture movement was – superficially at least – changing society on an almost hourly basis. Alternative voices – previously either marginalized or simply mocked – were now being declared the new saviours of humanity and all that. In music Partch, and others of his generation including Henry Cowell, Lou Harrison and John Cage were being cited as major influences by a new wave of American minimalist composers. What these composers had in common – probably all they had in common – was that they all came from the west coast of America; the traditional home of new & alternative ideas,from the hippie and the dippy to the musical influence of Eastern art and philosophy. Partch had mixed feelings about this new level of popularity. After years of being a happy outsider, he found himself being forced inside. He didn’t like it. Partch resented being compared to anyone else, particularly his nemesis John Cage. After a lifetime swimming against the current, weakened by drinking and by his former hobo lifestyle, Partch finally died in the autumn of 1974. Harry Partch was an outsider in the truest sense of the word, composing in cultural isolation and living a kind of transient/hobo existence. But he was also one of the most unique and innovative musical figures of the 20th, or any other, century.